For awhile now we have been tossing around the idea of having a book club. We both love to read, and with Carrie Beth's New Year's resolutions fresh in mind, this seemed like the perfect time to kick it off. Our plan is the first of each month we will announce the book club selection, then the following month on the first we will kick back with a glass of wine (because all good book clubs require wine drinking right? ), give our reviews and discuss the book with you guys in our comments section, and then announce the following month's selection. Fun and easy enough right? We both have similar tastes in reading, but will try to make sure we select something from all genres. We are also open to any suggestions and would love to hear from you for possible ideas on future selections. 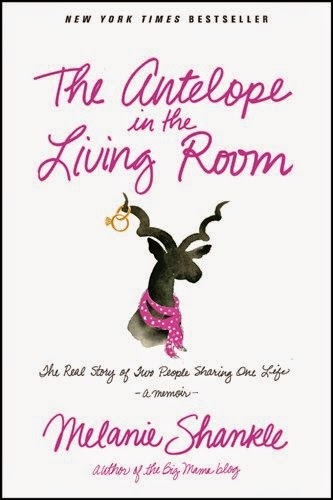 Our first selection is Melanie Shankle's The Antelope in the Living Room. We both love reading Melanie's Big Mama blog, and really enjoyed her first book Sparkly Green Earrings. Her blog is hilarious, and her take on life is refreshing. Marriage . . . you gotta laugh. They say that marriage is a lot like insanity, in that they both require commitment. I so get that. When you’re in those first giddy stages of dating, you have no idea what life is going to throw your way. You’re just two bright-eyed kids full of optimism, convinced you’re going to be the happiest married couple ever. Y’all. Trust me. Saying, “I do” is easy. It’s the next fifty years or so that can get a little tricky. There are days you feel like you’ve never loved each other more. But there are also days filled with disappointment and silence that never seem to end because you just can’t seem to find the words to make it right. And yet we are in this thing together. For the rest of our lives. Not just for better or for worse, but for better AND for worse. That’s what this book is about. The times that brought us together and the times we were falling apart. The days we wouldn’t trade for anything in the world, and that time he hung an antelope on my wall. See you on March 1st! Happy Reading Everyone! I wish I could join in, but I'm eyeball deep in the Outlander series. I'm on book 6 out of 8, so maybe I'll be able to join in at some point!